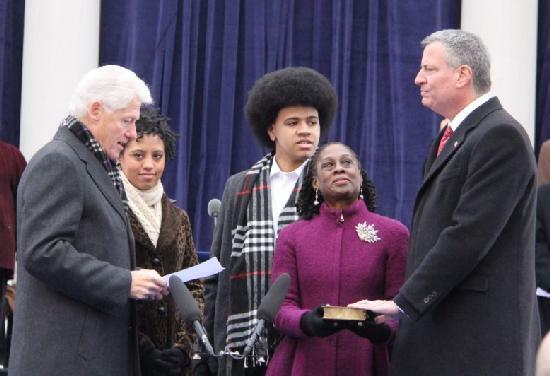 Former President Bill Clinton swears in Bill de Blasio as his humbled wife Chirlane holds the Bible and daughter Chiara and son Dante proudly look on. *Thousands braved frigid cold weather to attend the swearing in ceremony of New York’s 109th Mayor Bill de Blasio who pledged to close the gap between the “haves” and “have nots” in the nation’s largest city, on Wednesday, January 1, 2014, on the steps of City Hall as New York’s 109th mayor. Former President Bill Clinton administered the oath of office at a ceremony outside City Hall using a Bible once owned by President Franklin Delano Roosevelt. As his proud wife Chirland McCray de Blasio held the historic Bible, De Blasio took the oath with the couple’s children, Chiara and Dante, at his side. On the landslide results of his November electoral victory ending a long losing streak for Democrats that began when former Mayor David N. Dinkins, lost to Republican Rudy Giuliani in 1993, de Blasio was ready and fit to take office. His inaugural speech addressed mounting issues important to New Yorkers that would bridge the gap between the very rich and the very poor – something that was missing during the 12-year reign of Mayor Michael Bloomberg whose policies de Blasio said favored the rich. De Blasio who campaigned on putting a stop to “stop-and-frisk” — in which police stop, question and frisk people they deem suspicious, even if they’ve committed no crime — was one of the most controversial policing techniques in recent time. Law enforcement and other proponents said the practice helped reduce crime. To critics, it’s racial profiling. To De Blasio, it had to be transformed. “We will reform a broken stop-and-frisk policy, both to protect the dignity and rights of young men of color, and to give our brave police officers the partnership they need to continue their success in driving down crime,” de Blasio said. Unfortunately, de Blasio inherits a city with the highest level of homelessness since the Great Depression, according to advocates. More than 52,000 people, including 22,000 children, spend each night in city shelters. Also sworn in Wednesday was Scott M. Stringer as the 44th Comptroller of the City of New York. Letitia James, who as public advocate, becomes the first Black woman to hold citywide office in New York City. All three knock-down speeches left Bloomberg not in such a groovy New York State of mind especially since his administration has implemented successful innovative programs, policies & initiatives that have made “The Big Apple” a better, cleaner, safer place to work, live, and raise a family. Although none of the attacks mentioned Bloomberg by name, their target was clear. Through it all, Bloomberg took it on the chin while slumped in his seat and staring straight ahead. However, when former President Bill Clinton started praising his work Bloomberg sat up straight and smiled. 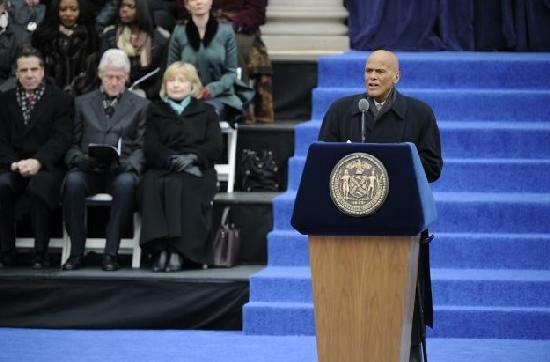 “I also want to thank Mayor Bloomberg, who has committed so much of his life to this city. He leaves this city stronger and healthier than he found it. More people are coming here than leaving,” Clinton said. Clinton praised both mayors. “With all of our challenges, people know somehow deep down inside there’s something special about New York. So, I’m grateful to both mayors — Mayor Bloomberg for his years of service, and for the legacy he will leave, and to Mayor de Blasio for his good and caring hands,” Clinton concluded. Increased Taxes: Under this keynote proposal, those earning more than $500,000 a year would see their tax rate rise from 3.9% to 4.4%. Someone earning $10m would pay about $183,000 more. The revenue would fund universal pre-kindergarten. Affordable Housing: Service workers are increasingly being forced into the far-flung reaches of the outer boroughs as rents and property values soar. De Blasio says he will make private developers include affordable housing in all their schemes, aiming to create or preserve 200,000 units over the next 10 years. Education: De Blasio has vowed to stop the trend towards charter schools encouraged under Michael Bloomberg, and end the closing of failing schools. He wants to move away from an emphasis on test scores to grading schools and teachers. Stop-And-Frisk: De Blasio made the surge in street searches of largely black and ethnic minority New Yorkers under Bloomberg a centerpiece of his campaign. His new police commissioner, Bill Bratton, returning for a second stint at the helm, has promised to rein back on the practice. On Sunday, January 6, 2014, thousands of visitors lined up to meet & greet and get a photo-op with Mayor de Blasio as he opened the doors of Gracie Mansion to the public which was on his first orders of business to give the people of this great city a chance to get a glimpse of his new home. “Gracie Mansion is the people’s house,” stated de Blasio. Visitors holding specially issued tickets lined up outside the historic “people’s house,” at 88th Street and East End Avenue on the Upper East Side, and patiently waited for hours for their chance to meet their new mayor and take guided tours throughout his new quarters. The 214-year-old building underwent a multi-million dollar renovation paid for by the then Mayor Bloomberg but sat vacant for the last 12 years after the former mayor elected instead to live in his lavish Upper East Side town house. When they finally make the move from their Brooklyn brownstone, the de Blasios will be the first family to occupy the 214-year-old Federalist-style mansion, located on the banks of the East River, since Rudy Giuliani’s family left in 2000. 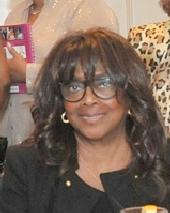 Previous ArticleSheryl Lee Ralph: New Year, New You!